Today, on July 6, the birthday of Heather Nova, I have finished the job that I started in April 2006. I wanted to program a new content management system in PHP, from scratch, because existing CMS programs didn't match the needs of the HN Online Magazine. Heather was on July 29 in Tienen, Belgium at the Suikerrock festival (sugar rock) and she was on July 31 at the Poolbar Festival inFelkirch, Austria. If you have seen Heather live on stage than please share your point of view with us, or if you have pictures than share them with us too. We’ll give you all the credits and you’ll be helping other fans who aren’t able to come to the shows in Europe. Next performance will be on August 2, in the Hague. 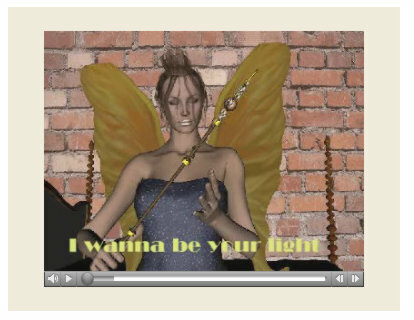 The x-mas special, I wanna be your light, an abstract 3D computer animation with some real footage of Heather Nova has been restored. For the MS Windows mediaplayer, go to the section "Multimedia, tribute to Heather, Xmas special - medium quality". For the Apple QuicktTime mediaplayer, go to the section "Multimedia, tribute to Heather, Xmas special - high quality". You can also download the videoclips via the section "downloads". 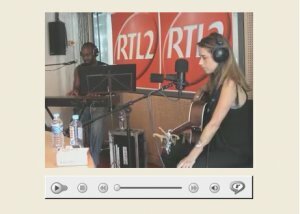 Two Heather Nova videoclips restored, they didn't work on the 'old' site, which was caused by the migration of the site somewhere in 2003. But now you can watch them again on our site, I am talking about "Virus of the mind" and "Someone New" . Go to the section "Multimedia, Video" to see other videoclips of Heather. 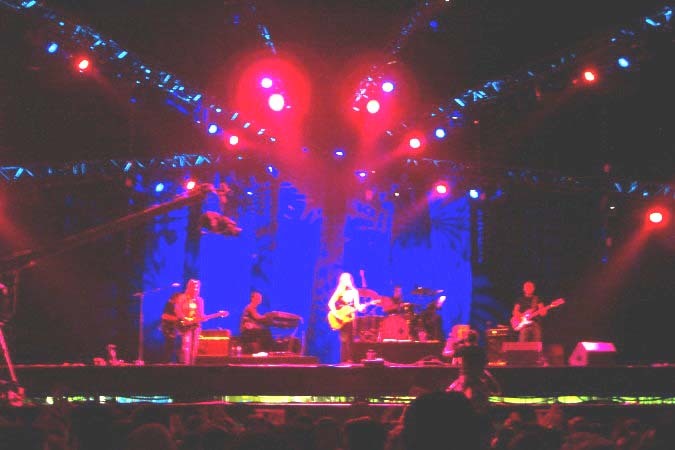 Here you can also see Heather Nova live at the Pukkelpop festival in 2005. Here you can also see a complete videoclip of "Fool for you"
It is now possible to download some videoclips and files that we like to share with you... the list will grow in the future so keep coming back. Go to the section "Download"
Though I keep things simple as possible, I understand that you wonder how it works? That’s why I’ve decided to write a little ‘how to’ tutorial. Go to the section “all about hn qcms,about the forum” for more information. The outcome of the last poll held in April 2006. Did you know that you can now vote? Because the content management system is provided with a poll manager, which ease the job creating a poll. Nevertheless, 32.7 percent of the people like Heather’s Siren album the most. 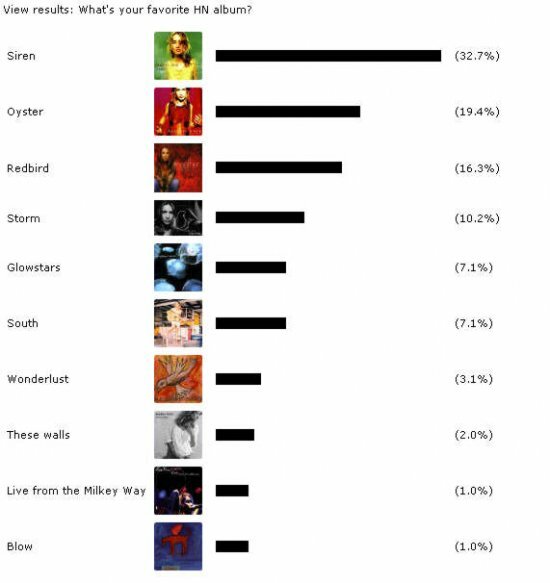 The second favorite album was Oyster with 19.7 percent and Redbird came on the third place with 16.3 percent. You could say that, reading the results, Heather’s next album should be more a ‘Siren like’ album. What’s the difference between Redbird and Siren? Heather said about the Redbird album that it’s more a rock album and who are we to disagree on that? But Siren is also a rock album. But on Siren we could hear the cello of Nadia Lanman and perhaps is that the secret ingredient, the cello I mean though the sound of a violin isn’t bad either. And the cello can also be heard on Oyster, which came on second place. Here you can see the results of the poll we started in April 2006 (it's now closed). The topic “creativity” is restored today and I’ve made it better because now you can download the video lesson ‘Walk this world’ (for personal use only and only in QuickTime format!) and you can download the interactive lesson in Flash format too. But remember: the guitar lesson is for personal use only! P.S. Walk this world is written by Heather Nova, don’t pretend it’s yours! Also: did you buy the Oyster album yet? Because you can find the song “Walk this world” on Oyster too! And don’t forget: buying a Heather Nova CD also means that you’re supporting Heather, which is a good thing. As you probable notice is the Heather Nova Online Magazine not complete yet. Though the ‘old’ articles’ are still here on the site. So nothing is lost. I am busy right now in bringing all the ‘old articles’ and multimedia files back into the new system I built in PHP, so that you can watch your favorite video-clip etc. You don’t need to worry... it will all come back to pieces. And if you want more tools, just post it on the forum (but you need to become a member first because I want to get rid off all the spam I received in the past on the old forums and on the guest-book. And yes... the .info site will change from AngelineCMS into HN QCMS too in the future and HN QCMS will come available as a download after I’ve tested the system enough and have written a manual. I visited your website and read about the SCAM ...Could you please inform me about your idea which you have already written! Do you mean that NCARDS organisation is not real one and their E-mail to us for participating, is as the funny one or they want to kid others? I received a phone call from someone living in the same area of the ‘convention’ and he became a victim of the scam. He payed a couple of hundreds of dollars for a hotel that doesn't exists. If you look closely to their site than you'll see it's all in bad English too, though they claim to be an American organization. Yes, the NCARDS organization is a scam. Don't fall for it! Click here for nore information about the scam.